alaTest has collected and analyzed 18 reviews of Panasonic BL-C131A - Network camera - pan / tilt - color ( Day&Night ) - 802.11b, 802.11g. The average rating for this product is 4.4/5, compared to an average rating of 4.0/5 for other products in the same category for all reviews. We analyzed user and expert ratings, product age and more factors. 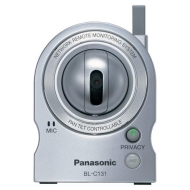 Compared to other products in the same category the Panasonic BL-C131A - Network camera - pan / tilt - color ( Day&Night ) - 802.11b, 802.11g is awarded an overall alaScore™ of 76/100 = Good quality. It definitely worth the money. The power brick and camera can get pretty hot which makes me wonder about the long term reliability (the first one we bought is now about 2 yrs old). I think I'll buy a second one for front door surveillance. I dunno, this is my first pet cam, but I'm very impressed with the camera and tech support. I've used this camera for over a year and have been very pleased with its performance. Place this plug-and-play camera in your home, office, vacation home, or almost anywhere else you'd like to keep an eye on things, with no PC required at the location. The camera can be viewed and controlled from a standard Web browser, video display, or even a compatible cell phone or PDA, with no additional software required. All of the other required software is already inside the camera. With the built-in heat sensor, the camera can be set to record and/ or notify you by email when someone enters the room. It can even automatically move to a preset location when triggered, just in case someone was viewing a different part of the room. With the built-in Privacy mode, your privacy is protected by simply pressing a button. An indicator on the front of the camera turns red, and you know at a glance that the camera is now only accessible by you. The camera can also be set up to show a green light when the camera is being accessed. The camera can be set to automatically record video at certain times and certain speeds. In addition, with optional, external sensors attached to the camera, it's possible for the camera to email or record when triggered by motion, sound, light, timer, or even a push button. These convenient functions eliminate your need to constantly check the image.